This week everything got put aside so I could make three new quilt covers and pillow cases for our new grandson. I've not done any home making or dress making for years so it was a good test for me to see what I could remember and dust off some cobwebs. Daughter-in-law was well chuffed with the results, and I must say I surprised myself and was quite pleased with them too. Above is just one of the sets I made, and below the pillow to another. Unfortunately the patterned fabric was just a tad too small in width so I had to be creative and make a border all the way around on this one. The other pillow case fabrics were just short on the length and were fixed with a contrasting piece of fabric at the end. They're not perfect by any means, but as long as they wrap the wee one in love and comfort - that's all that matters. Sorry I've been away so long, but my hands haven't been idle. I have managed to complete my experimental cutwork sample for Module 11. 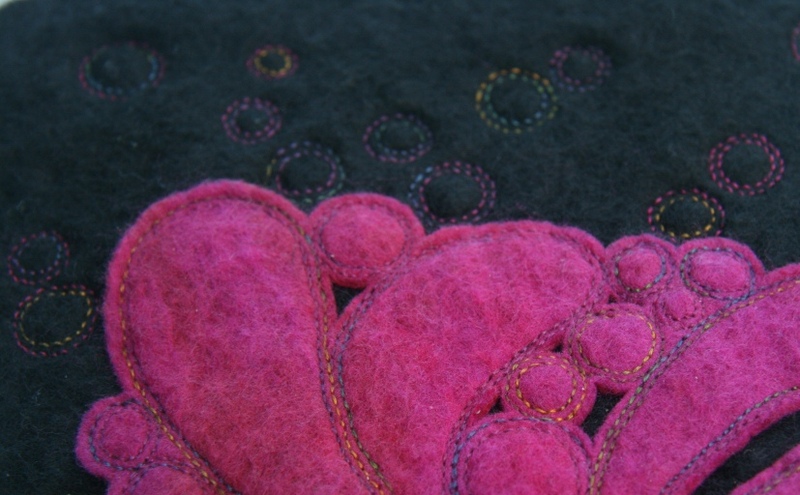 I used two layers of handmade felt and a multicoloured thread. I don't want to give away too much info yet until I've lodged my design for assessment, so I'm just giving you a little peak at part of the design. Hopefully it won't be long until I've got the whole module finished and can upload the complete piece.